"What is the creature that works on four legs in the morning, two legs at noon, and three in the evening?" so goes the riddle of the Sphinx in the mythic tale of Oedipus. There is no dearth of sunlight in Southeast Asia, but there is likewise no dearth of milk and calcium in the West, and yet osteoporosis remains a scourge of humankind ever since the birth of civilization and when lifespans hurdled beyond seven decades. At this juncture, we face the greater riddle of osteoporosis, how to save our bones and joints from the ravages of time, the pain and disability it wroughts upon those already besaddled with failing vision, fading memory, and dementia. How can we grow old gracefully with regal posture, eagle eyes, and agile minds, not a burden to family and society? 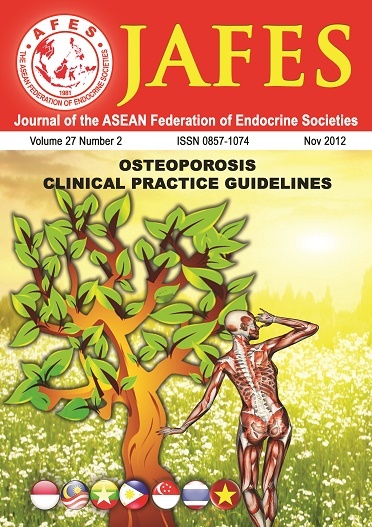 In this issue of JAFES we publish the latest attempts to answer the greatest riddle of preventing osteoporosis from a Southeast Asian perspective.